At a time when other NFL teams are discouraging player protests, the Seahawks are welcoming it. When the NFL player introductions take place at home games, before the playing of the anthem and opening kickoff, you always want to notice the first person out of the tunnel. Those players are chosen because they’re counted on to get the crowd going and shake the seats. In Seattle—where the fans are so loud kids show up to the game with ear plugs—the first player out at the home opener was defensive end Michael Bennett. He emerged from the tunnel without a helmet, and the crowd went wild as his face went up on the Jumbotron, while he jumped up and down, waving his hands and arms. Then, instead of running all the way onto the field, he stayed about 20 feet in front of the tunnel entrance, high-fiving every defensive player while the fans turned the cement-and-steel Century Link stadium into a quivering massage bed of delirium. That the team would have Bennett come out first was a declaration unto itself. Ten days earlier, Bennett went public with a story of police violence, speaking about having a gun put against his head in August by Las Vegas officers who threatened his life while he was handcuffed on the pavement. He was let go only after police figured out who he was, as he sat in the back of a police car. Bennett, who has been outspoken against police killings, described what took place as an instance of racial profiling. This provoked a huge backlash both from the Las Vegas Police Union and the alt-right sewers of the Internet. Bennett had already been in their crosshairs for sitting during the anthem. Even as video emerged showing a weapon placed against the back of Bennett’s head, he was called a liar for reasons no deeper than the argument that, since the cops were Latino, it could not have been profiling. Highlighting Bennett was a statement, and the crowd responded with love—another statement. Then there was the anthem itself. Bennett had been sitting alone, but on this day, he was joined by fellow defensive linemen Cliff Avril and Frank Clark while teammates Justin Britt and Thomas Rawls stood alongside him in solidarity, a hand on each of his shoulders.. While they sat, Pearl Jam guitarist Mike McCready played a discordant Jimi Hendrix–inspired electric guitar version of the national anthem. For the last note, as the crowd cheered, McCready turned his guitar around revealing a big number 72–Bennett’s number. Then during the game itself, Bennett registered a critical third-down sack and stood up, raising his fist in the style of 1968 Olympians Tommie Smith and John Carlos. All of the above took place after the pre-game politics: an NAACP sponsored march of several hundred Seattle residents to the front gates of the stadium. The most prominent signs read, “12th Man for Racial Justice,” in reference to the nickname of the Seahawks rabid fan base. The protest and rally was originally intended to be in solidarity with free-agent quarterback Colin Kaepernick. 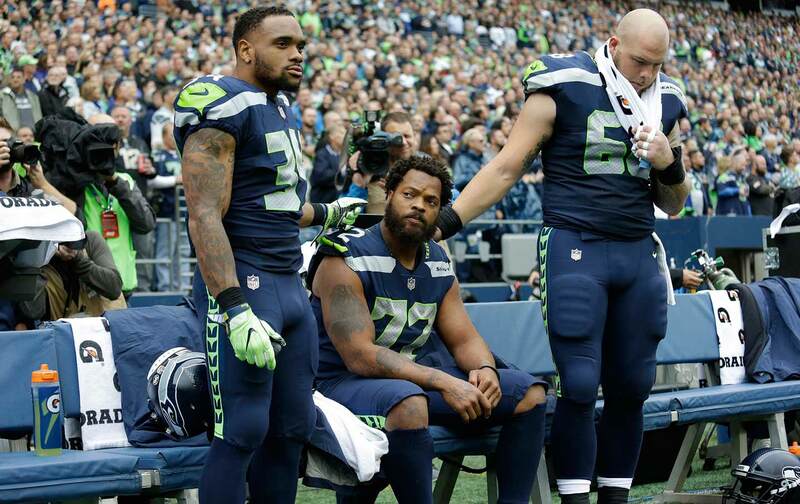 But after the Vegas incident it turned into something to show love for a football player who has been there for Seattle residents in grassroots movements like few other pro athletes. Seattle teacher Jesse Hagopian also spoke about Bennett’s support for his union’s Black Lives Matter At Schools initiative. He said, “The police were hoping that the Vegas PR slogan of ‘what happens in Vegas stays in Vegas’ would hold true for them. But they didn’t know Michael Bennett. And if they did, they would have known that Michael Bennett would not have stayed quiet…. so I hope Michael gets a sack every Sunday, but we know he’s sacking injustice every day of the week.” Other speakers included Michael’s brother Reshaud Bennett, who spoke movingly about what this kind of community support has meant to their family, and attorney Nikkita Oliver, whose grassroots People’s Party mayoral campaign, almost pulled one of the great political upsets in recent history. As the march made its way to the stadium, weaving through 70,000 people, it is worth noting that there was no heckling from the fans. This city supports Michael Bennett just as it supports the Seahawks. The team gets that, and no slander from the Las Vegas PD is going to change this reality. The Seahawks won the game against the San Francisco 49ers 12-9, the defense once again carrying the team. Fans here started to defend Michael Bennett because he is so indispensable on the field. They are starting to see him as indispensable off the field as well.